You know when you arrive at the track and are catching up with all your girlfriends and then she walks in. Her outfit blows your mind, her dress is perfection, she's nailed the perfect colour clash, her accessories are onpoint and omg those shoes? Yep I think everyone in attendance at WA's Myer FOTF competition thought this when Annabel Davey walked in. Annabel has been entering FOTF for 10 years now and this year was sashed the winner and has since joined her respective contemporaries from other states around Australia at this years Melbourne Cup carnival. With her red lace dress, light blue straw Reny Kestel Millinery and light blue and green accessories it was clear from the start that is was Annabel's year. 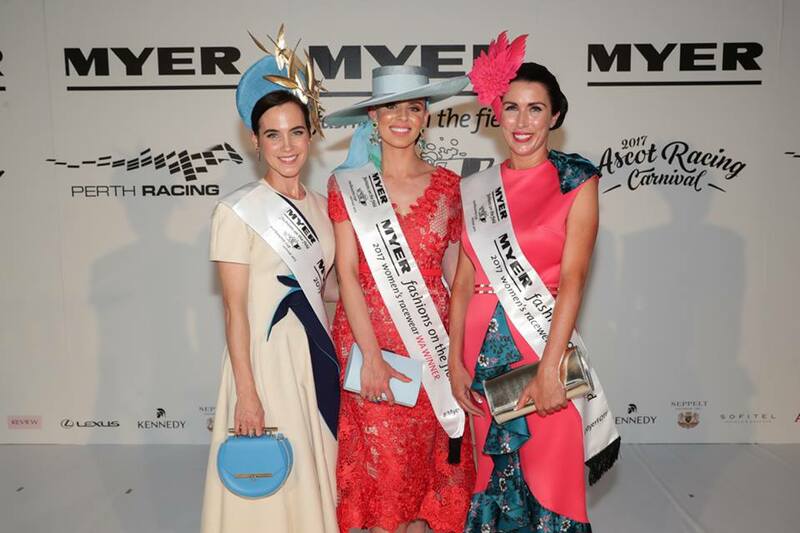 Annabel - Fashions on the field perfection. The competition for the top spot was as fierce as usual. Lets look at some amazing outfits put together by their glamorous owners. Reigning WA Country Cups Winner Dr Sarah McEwan went all out in this stunning bright dress and bejewelled crown. Elizabeth Winlo (Nee Pollard) who won the National Myer FOTF in 2009 looked stunning in this bone coloured linen dress with navy and bright blue detail. Her Millinery is by Reny Kestel and her bag was made in the USA. Luka Hasset wowed in Best Dressed Accessories bright yellow midi dress complimented with red shoes and millinery. The top 3 Elizabeth, Annabel and Suzie sashed up and looking fab! It was a wonderful and exciting day at the track and on the runway. Annabel we wish you the very best when you take on the other state champions at the National competition this week. You are our pick and we are so glad to have such a lovely woman representing out state. Congratulations Annabel. Best Dressed Accessories Owner Bethany Brajkovich in her own design sewn by Fyne Fit, Millinery by Holly Barker Millinery, clutch Olga Berg and hand made earrings by Stuart of The Glitter Co Subiaco.